There's a pretty good chance you'll laugh when you see how simple this grilled Tilapia recipe is. 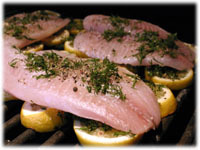 I mean, how hard can it be to grill tilapia on a bed of lemon slices and fresh dill spread across the grates of your BBQ. Don't be fooled by the short ingredient list in this recipe, it's not what but how this is cooked that makes the difference. 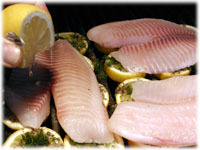 It's this unique grilling method - cooking on a bed of lemons - that makes this the best way to cook Tilapia. 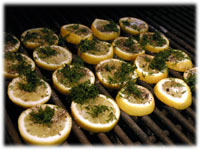 There's no marinating required, just slice the lemons, lay them on the grill, cover with some fresh dill, pepper and salt, lay the tilapia on the lemons and away you go. 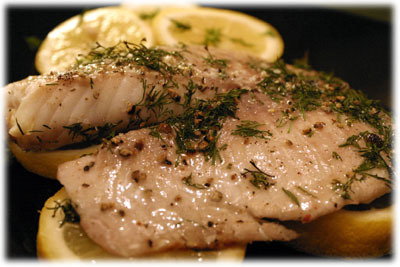 As the heat from the grill goes through the lemons, the intense lemon and dill flavor infuses into this delicate fish. 1 bunch fresh Dill, chopped. Slice each lemon into 1/4" slices. 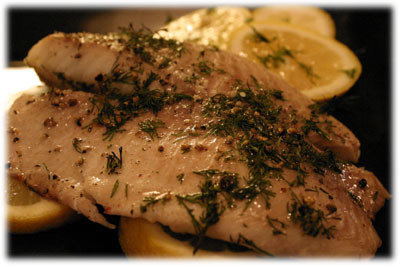 You'll need the slices of 2 lemons for each tilapia fillet. 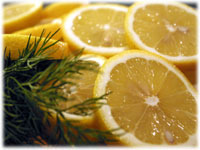 Reserve 1 lemon to use for squirting on top of the fillets as they're cooking and when they're removed from the grill. Preheat the grill to 550F - 600F. 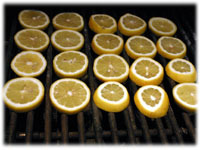 Lay the all of the lemon slices on the grill with a little space between each slice. You're going to be laying the tilapia on top of these so make sure their positioned in a way that the fish won't be touching the grill. Sprinkle some of the chopped dill, cracked peppercorns and kosher salt over each of the lemon slices. 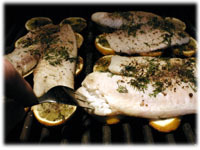 Lay the Tilapia fillets on top of the lemons so none of the fish is touching the grill. Squirt some lemon juice on top of each fillet. Sprinkle some of the chopped dill, crushed peppercorns and kosher salt over each fillet. Close the lid for 6 - 8 minutes. You'll have lost some of heat from the BBQ but with the lid closed again it builds back up. The time and temperature are perfect to cook this fish. After 6 minutes lift the lid and carefully check to see if the fish flakes easily with a fork. If it doesn't then close the lid and wait 2 more minutes. You won't be flipping the pieces over with this grilled tilapia recipe, it's completely cooked just the way it sits on the bed of lemons. When the flesh flakes easily with a fork, carefully lift the fillets off the lemons with a large spatula onto a serving dish. 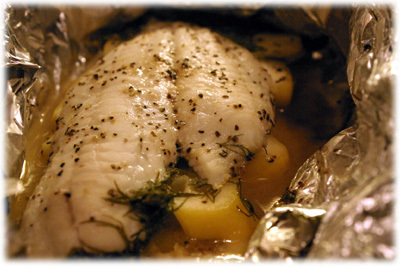 Squirt with lemon and cover the dish with foil for 5 minutes.